This classic tale of “boy meets girl, Dad doesn’t approve”, has been told since the 2nd century B.C.E. and celebrated in summer festivals in China, Japan and Korea. You can read this story every night in the summer sky. The “heavenly” river that separates the young couple is the Milky Way. The lovers are represented by the stars Vega and Altair, two points in the asterism known as the Summer Triangle. The triangle shape is actually made up of the three brightest stars from three different constellations, Cygnus the Swan, Lyra the Harp and Aquila the Eagle. In the city, it is often difficult to see all of the very faint stars of these patterns but the brightest from each are visible on clear nights. The brightest is Vega, the dimmest Deneb, and Altair makes up the point of the triangle. You can find the Summer Triangle higher overhead, across the sky from the Big Dipper all summer long and even into autumn. Interested in what else you can see up in the summer sky? 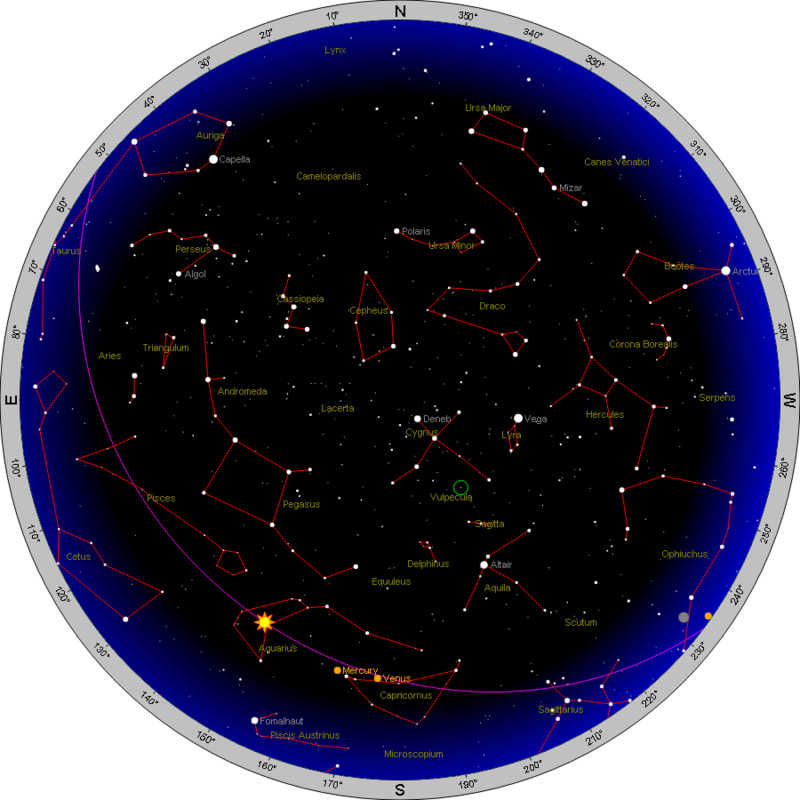 Head to our Current Night Sky page. The highlight of August sky observing is the Perseid meteor shower. A meteor shower is a high occurrence of shooting stars over several days. Of course, “shooting stars” aren’t really stars at all, but dust-sized bits of rock or metal (meteoroids) that collide with the earth and burn up in our atmosphere. As they vaporize, they cause a brief streak of light in the sky (a meteor) which can be seen from the ground. Rarely, a larger version of a meteoroid survives its time as a meteor and makes it to the ground intact; we call these meteorites. Confused with the similar-sounding names? The long and short of it is that dust from space burn up in our atmosphere, making brilliant flashes of light that result in a spectacular cosmic show. But where do these specks of dust come from and why do they sometimes come down all at once in a shower? The answer lies in the earth’s yearly path around the sun. The earth orbits the sun and acts as a cosmic broom to any smaller objects in its path. It just so happens that between mid July and mid August every year, Earth is travelling through the trail of dust left behind by a comet. Comets are balls of ice and dust that orbit the sun. Small chunks can break off as the comet travels through space. When we pass into the path left over from its travels, those chunks collide with the earth. The Perseids are caused from dust and debris left over from Comet Swift-Tuttle (109P). It depends. The maximum number of meteors you could see depends on how dark your sky is, what time you observe, and how long you watch. It’s best to get away from city lights, since the fainter meteors are easy to miss when there are bright lights around. Although we are moving through the densest part of the dust trail on the evening of the 12th, meteor showers are always better after local midnight due to the orbital geometry. Your best bet will be between 11 p.m. and 4 a.m. on the night of August 12-13, with rates increasing towards dawn. You might see upwards of 50 meteors an hour. Don’t expect to see a constant stream of meteors; you might see one then nothing for twenty minutes then a whole bunch. Don’t give up if you haven’t seen any, best practice is to observe for at least an hour. The best thing about meteor showers is that you don’t need any specials tools to see them! Just relax, grab a lawn chair or a blanket (and maybe some bug spray, let’s face it, this is Manitoba after all), lean back and look at the sky! Your ability to see the streaks of light can be hampered by clouds, high buildings or light pollution. Even a particularly bright moon can obscure your view. Luckily for us, the moon will be very new on the evening of the 12, allowing for near perfect viewing conditions. August 12th between midnight and dawn (morning of the 13th) is the night you will see the most meteors but you can actually start to see the Perseids every night as early as July 17rd and as late as August 24th as we move in and out of Swift-Tuttle’s path. If you’re worried about missing the big show, you can start to practice by doing a little meteor gazing every night. Claire Woodbury is a Science Communicator in the Manitoba Museum’s Planetarium and Science Gallery. As many people have heard, there is a solar eclipse occurring on Monday, August 21st, 2017. On that day, the moon will pass in front of the sun from our point of view here on earth, slowly covering it and then uncovering it over the course of a few hours. Where you are on the planet will determine what you will see, but no matter where you are, this is a great event to watch. If you happen to be in the right place on that day, you will see a total solar eclipse – one of the truly amazing spectacles of nature. Unfortunately for Manitobans, “the right place” this time around is a narrow path that crosses the central United States from Oregon to South Carolina – the closest part of the path is a good 12-hour drive to the south. 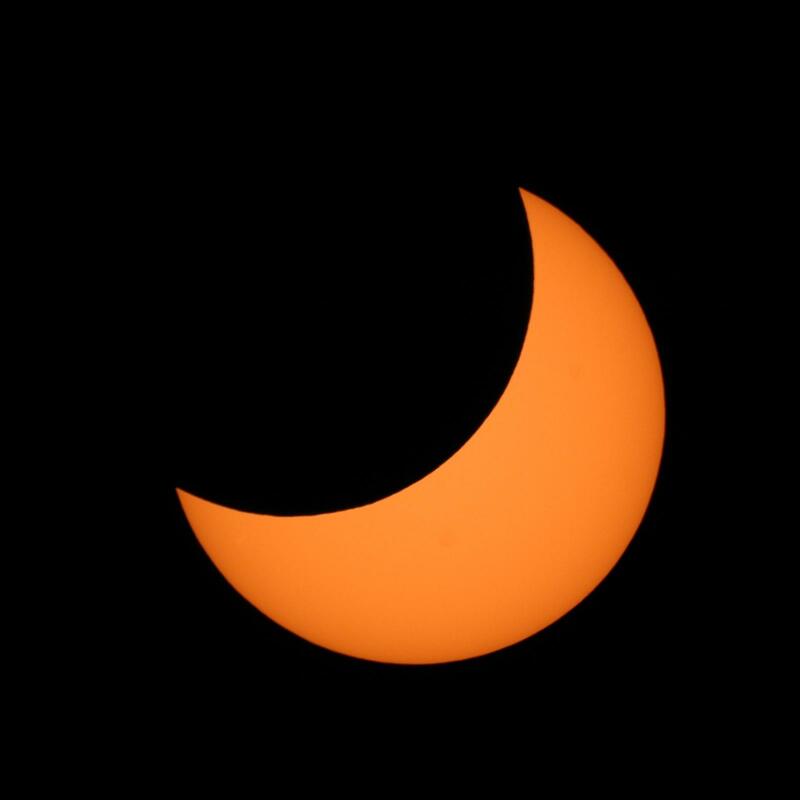 However, Manitobans will still see a sun that is nearly three-quarters covered by the moon – the best eclipse we’ve had here in nearly 40 years. Here’s how you can watch safely, and what you can see. Never look directly at the sun or partially eclipsed sun without protective eclipse shades – Sunglasses do not protect your eyes adequately when looking directly at the sun. The Manitoba Association of Optometrists encourages Manitobans to take care of their eyes, through regular eye examinations and by protecting their eyes from the sun and other dangers. For regular wear, sunglasses that provide 100% UVA and UBV protection are recommended. Ask your optometrist for recommendations. There is no way to safely filter a telescope at the eyepiece end – any filter that is placed where the light is already focused to a point will crack or melt and blind you. You can buy solar filters that fit over the front opening of your telescope, which do the same thing as eclipse glasses: they reduce the intensity of light to safe levels. However, these filters cost upwards of a hundred dollars, and it’s already becoming hard to order them since we are so close to the eclipse. If you’re just starting to plan your eclipse-watching, you have a few other options. You can use your telescope to project an image of the sun onto a nearby wall or piece of cardboard. This is completely safe, and also allows a whole group of people to see the sun’s image at once. You can do it with binoculars or a telescope by following the instructions here. You can also come by the Planetarium on Eclipse Day. If it’s clear, we will have safely-filtered telescopes set up around the Planetarium dome to view the eclipse. We’ll also have a live video feed from the path of totality, where several of the Planetarium staff will witness the event and provide live commentary. Below are the various times of the eclipse for selected locations around Manitoba and Nunavut. 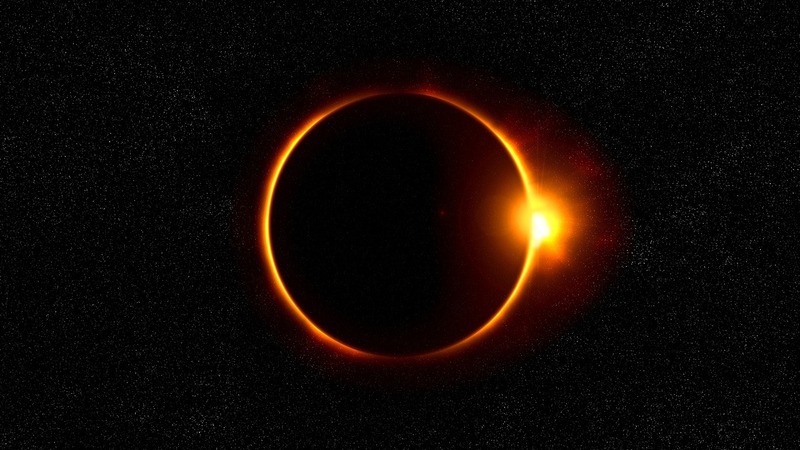 For other locations, visit Heavens-above.com and select your location, and then click on “Solar Eclipses” on the front page. Although summer may feel like it’s a long time from now, it’s not too early to start planning for at least one summer blockbuster event. On Monday, August 21, 2017, the moon will pass in front of the sun, causing a solar eclipse which will be seen all across North America. For a narrow line which runs across the central United States, the eclipse will be total: the moon will completely cover the bright part of the sun, providing a couple of minutes of the most amazing sight nature has to offer on this planet. For the rest of the continent, the eclipse is partial: the moon covers up only a part of the sun – still interesting and amazing, but not the show-stopper that a total eclipse is. If you want to travel to the center line to see totality, you’d better plan on doing some driving. The path is about 10 hours south of Winnipeg at its nearest, assuming you drive. Flying cuts this time somewhat, but you’ll still need a vehicle the day of the eclipse, because all of the hotels along the path of totality have been booked for several years. This is the first total solar eclipse that has crossed North America since 1991, so folks have been planning for quite a while for this event. At this point you’re looking at staying a few hours away and then driving to the center line the morning of the event. Although this might seem inconvenient, it does provide you with the flexibility to travel based on the weather. Clear skies = beautiful view of total eclipse; cloudy skies = nothing to see. Over the coming months, we’ll provide more details on the eclipse event itself, including what local viewing options there are and how you can see the eclipse safely yourself. The Planetarium is not running a tour for this event, but we will be hosting programming and viewing of the eclipse from Winnipeg, where the sun will be 70% eclipsed. The Planetarium and Science Gallery will be running eclipse programming starting in July, so by eclipse day you’ll be well-prepared no matter where you choose to observe from. The view of a total solar eclipse is well worth some travel. I saw the last one visible from Manitoba, on February 26th, 1979, and it was so inspiring that it set the course of my life in astronomy and science education. If you do decide to include the eclipse in this summer’s travel plans, check out eclipsophile.com’s great page on the event. Put together by veteran eclipse chaser and meteorologist Jay Anderson and astronomer (and former Winnipegger) Jennifer West, this site is full of the details you need to decide where to observe the Great North American Eclipse. A new planet has been discovered outside our solar system. That wouldn’t normally be big news, since astronomers have discovered about 3,200 exoplanets, or planets that orbit stars other than the Sun. This one is rather special, though. First, it’s about the size of our planet earth. That generally means it is made up of the same sort of things that the earth is made up of – rocks, not gasses. It’s probably solid, like our own planet. Second, the new planet orbits its star in the “Goldilocks zone”. That’s the area that isn’t too hot or too cold for liquid water to exist. That means, if the planet has an atmosphere, that there could be liquid water on its surface – and that opens up the possibility of life. Even more exciting: this new planet orbits the closest star to the Sun – it’s literally as close as a planet could be to our solar system. The star is called Proxima Centauri, which is part of the Alpha Centauri star system. It’s about 4.2 light years away – so, it’s still REALLY far away. If you tried to go there in any of the rockets we have now, it would take more than 100,000 years to get there. Long trip, better bring a book. Here’s an artist’s conception of what it would look like from the surface of Proxima B. The bright star is Proxima, and the two fainter ones in the background are Alpha Centauri A and B, which are part of the same triple-star system. 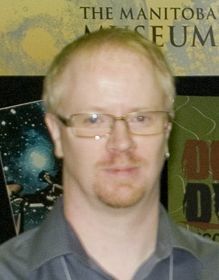 The new planet was found by European astronomers, using a technique first pioneered by Canadian astronomers Gordon Walker, Bruce Campbell and Stephenson Yang back in the 1970’s at the Dominion Astrophysical Observatory in Victoria, B.C. The technique, which measures the wobble in the star due to the gravity of an unseen planet, has only recently become precise enough to detect tiny earth-sized planets. As of now, we have no idea if the planet has water, or an atmosphere, or aliens, or bacteria, or anything. We just don’t know. What we do know is that there’s nothing about the planet which automatically rules out the possibility of life. It has the right temperature range for water, its star isn’t too violent, there are no other factors which tell us that no life can exist there. We may have discovered our nearest neighbours in the galactic metropolis. Or, it may just be an empty lot next door to us that we can expand into. Either way, this is probably the most significant exoplanet discovery thus far, and seeing what cmoes next will be exciting. Perseid meteor shower – updates! Every year, the annual Perseid meteor shower occurs around August 11th and 12th. This year, though, is predicted to be a much more active shower than in previous years. What can we expect, why is it happening, and how can you see it yourself? As the earth orbits the sun, it crashes into bits of rock, ice, and dust which are left over from the formation of the solar system. These tiny fragments hit the earth’s atmosphere at cosmic velocities, quickly heating up due to friction and vaporizing tens of kilometers above the ground in a flash of light. These flashes are called meteors, and are also known as shooting stars or falling stars. On a typical night, if you can avoid any sources of light from cities and the moon, you can see a handful of these every hour. The trick is, to be watching the sky for that entire hour, because meteors are literally visible for a second or two and then gone. Don’t blink! In addition to these sporadic meteors, several times a year the earth travels through a denser trail of dust left behind by a comet. Comets are icy bodies that orbit the sun, growing a long tail when they get close enough to the sun. These comets leave a trail of ice and dust in their wake, and when the earth passes through the trail we get many more meteors than usual. This is called a meteor shower, and they occur about the same time every year. One of the best known showers is the Perseids, which usually peak around August 11th and 12th. This particular year, the earth is predicted to be going through an especially dense part of the meteor trail left behind by Comet Swift-Tuttle. This means we can expect more meteors than normal this year for the Perseids. First, don’t be mislead by some of the images floating around social media – the stars won’t fall like rain. If you go out at the right time, you will see a lot of meteors, but a lot depends on your local conditions. Here’s how to maximize your chances. Meteor showers always are best after midnight. Due to the geometry involved, when your part of the earth is experiencing “evening”, the meteors are hitting a glancing blow. Not many can catch up to the Earth in its orbit, so you will see fewer meteors than the predicted amounts. The silver lining here is that the few meteors you will see are usually the bright fast ones that leave a trail across the sky. Before-midnight viewing is definitely about quality, not quantity. Avoid city lights. Meteors are faint compared to streetlights, advertising signs, and other artificial lights. From inside the city, you may see a handful of meteors, but you’ll miss most of them. The best views are to be had from under dark country skies. Head out of the city, and set up with your back towards the brightest lights you can see. Avoid telescopes. Meteors can happen anywhere around the sky and only last for a few seconds – you won’t have time to point a telescope at them. Telescopes have very small fields of view, so you are only looking at a fraction of the sky at once. This is one type of astronomy that is perfect for the low-tech approach. The most useful piece of equipment is a reclining lawn chair or blanket to lay back on. Avoid the moon. This is usually the big variable between one year’s shower and the next. If the moon is full, you have a big source of light pollution that you can’t just drive away from. Luckily, this year, the moon is not full, but it’s close. 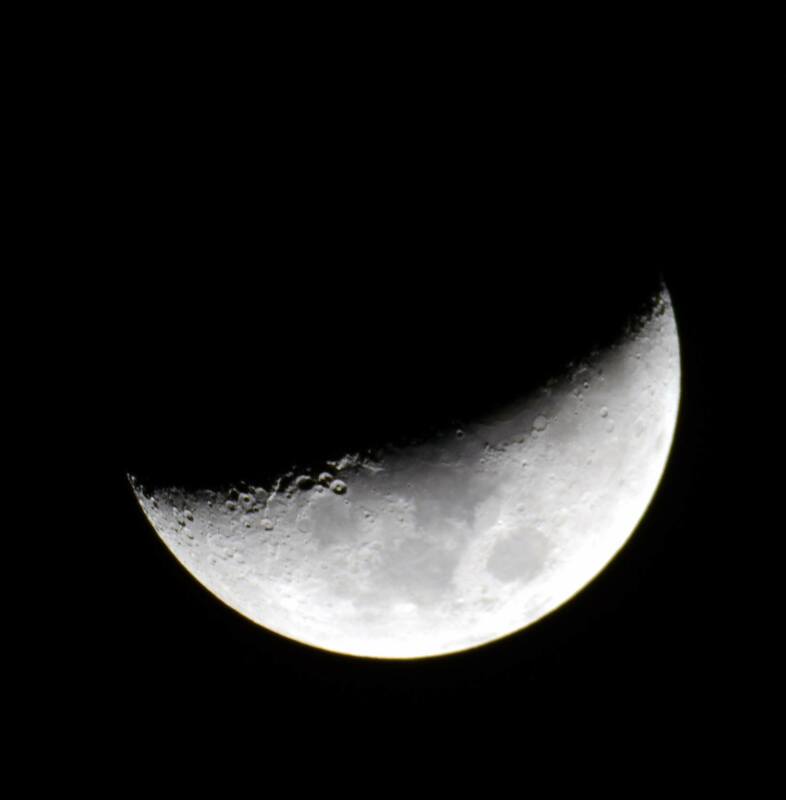 For Manitobans, the moon will set around 1 a.m. on the night of the 11th/morning of the 12th, giving us a solid three hours of dark skies until the twilight begins. Suggested viewing plan: Head out of town the evening of Thursday, August 11th. Find a palce where you can observe that avoids as many lights as possible. Ensure that you’re not too near a road or other hazard. (Make sure you choose a place that is not private property unless you have permission from the owner!) Set up your lawn chair with your back facing towards the brightest lights you can see, and just look up. Keep all lights off, so you eyes can adapt to the dark. If you look at a light (like your mobile device) for even a split-second, you will kill your night vision for several minutes. Even if the device is set to red, it is much too bright. Watch the sky for as long as you can, and just count the meteors! If you want to try capturing a meteor image on your camera or turn your observations into science, visit the International Meteor Organization’s web page – they have further details on how to make meteor counts and take images of meteors. As the planets orbit the Sun, their position in our sky changes. Right now (in May 2016), Jupiter is visible in the evening, with Mars and Saturn both rising later in the night. (See our Manitoba Skies blog for details.) There are two planets that orbit closer to the Sun than our planet Earth, and so they never appear late at night – from our point of view, they always appear close to the sun in the Sky. These two planets, Mercury and Venus, are usually visible soon after sunset or just before sunrise, depending on their location in their orbit. Venus is the bright “evening star” or “morning star” that most people have seen (if not identified), but Mercury is more elusive. Being closer to the sun, it is often very low in the sky, and only visible for a couple of weeks before its orbit carries it too close to the sun to be seen. However, this orbital geometry that works against us has one big benefit: every so often, Mercury or Venus will be seen actually silhouetted against the sun’s blinding surface. This event, called a transit, only happens a few times a century for Mercury and even less often for Venus. This MOnday, it’s Mercury’s turn to transit the Sun. Here’s how to watch. FIRST: NEVER LOOK AT THE SUN WITHOUT PROPER EYE PROTECTION. “Proper” means a special solar filter purchased especially for solar viewing – eclipse glasses or a specialized telescope filter. NOT SAFE: sunglasses; CDs/DVDs; smoked glass; or any of that stuff. If you don’t have a special solar filter you spent at least $100 on, it’s probably not safe. Do not risk your eyesight when there are easier ways to see this event without risk. Mercury is too small to see crossing the sun without some level of magnification, so those cardboard eclipse glasses won’t be much help for this event. (But save them – there’s a solar eclipse in August 2017 you’ll need them for!) This means, you need a telescope or pair of binoculars, which means you also need a specialized solar filter, or use an indirect method. HERE is how to turn your ordinary household binoculars into a safe transit viewer. NOTE: Make sure you follow the safety warnings on the video – watch right to the end. This clip was produced for the transit of Venus, but it works for this event and for general viewing of sunspots as well. If you don’t have your own way to view the transit, there’s still hope. You can join us at the Museum – the Galleries, Planetarium and Science Gallery are closed Mondays, but our staff will be outside behind the Museum (weather permitting) near the corner of Lily Street and James Avenue to view the transit, and you’re welcome to join us. You can also watch the event online from various sites around the world: search for “mercury transit live webcast” for several options. Watching the transit of Mercury lets you witness the clockwork of the solar system first-hand. Over the course of the day, Mercury’s tiny disk will cross the Sun, carried by its orbital motion. From this simple observation, you can see that Mercury orbits the Sun and is closer to the Sun that we are. Over time, astronomers also noticed that timings of the transit of Mercury were off slightly by what we would expect just based on classical gravitation effects; it would remain for Albert Einstein and his theory of General Relativity to explain the discrepancy. The transit you are seeing this Monday is one of the strongest and most reliable proofs that Einstein’s view of the Universe is correct. All that from watching a little black dot on the sun today! Although the weather hasn’t noticed yet, spring is on the way. March brings the Vernal Equinox, the official start of spring in the northern hemisphere. It also brings excellent views of the two largest planets in our solar system, a solar eclipse we won’t see from Manitoba, and a chance to catch the winter constellations in slightly warmer conditions. Read all about the events visible in Manitoba Skies this month on the Planetarium’s Current Night Sky page. This has been a busy week for solar system news. For early risers, you can see all five of the naked-eye planets at the same time before sunrise. This week also saw the announcement of some new research suggesting there may be an undiscovered planet out there, way out past Neptune. We’ll start with the easy one. There are five planets in our sky that can be easily seen with the unaided (or “naked”) eye – without a telescope or binoculars, but most of the time only two or three are visible at any given time. For the next several weeks, though, you can see all five at once. Just wait for a clear morning, get up early, and head to a location where you have a clear horizon to the south and southeast. You’ll want to observe about 45 minutes before the sun comes up, while the sky is still dark enough. The first thing you will notice is Venus, shining brightly in the southeast. Venus has been visible before dawn for months now, and since it is the brightest object in the sky after the Sun and Moon, a lot of people have noticed it in the southeast as they get up for work or school before the sun rises. The next-brightest object in the sky is the planet Jupiter, which was close to Venus last fall but has since migrated across the sky towards the southwest. That’s two planets. In between Venus on your left and Jupiter on your right, there are a bunch of bright-ish objects. About halfway between the two, and higher up in the south, is a fairly bright object that you might notice has a slightly red-orange hue. That’s Mars, planet number three on our list of targets. Between Mars and Venus is number four: the ringed planet Saturn. Saturn’s rings aren’t visible without a telescope, but it is the most distant planet you can see with your unaided eye, at over 1.5 billion kilometres away from Earth. Number five on our list is the most difficult one. The planet Mercury is tough to see, because it is so close to the sun we can only see it in the brightening twilight sky. Mercury appears to the lower left of Venus and very close to the horizon. As the days pass, it will rise higher in the sky as it orbits the sun, and then drop back down below the horizon again. You probably will only have a couple of weeks to see Mercury unless we have very clear skies and you have very good eyes, since the lower it gets the harder it will be to find. Binoculars can help you track it down in the twilight. If you want to add a sixth planet, just look around: the Earth is a planet, too. And the moon will move through the seen in the first week of February, along the path from Jupiter to Mercury in our sky. It’s a great time to watch the morning sky! Now, the other “planet” announcement this week, which suggests a new planet has been “discovered”. It hasn’t – at least, not yet. As usual, the social media sites blow everything out of proportion. Some new research suggests that some of the odd observations of objects at the very edge of the solar system could be explained if there were an undiscovered planet orbiting the sun at an incredible distance, far beyond Neptune. The trouble is, we don’t have a lot of data on what’s out there, so there are many possible explanations for the strange stuff we’re seeing. Definitely a story worth following, but don’t change the etxtbooks just yet. January has a number of interesting events in the night sky, easily visible by anyone who can see the sky. 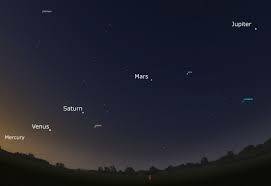 If you get up before sunrise this month, you can see four other planets (plus the Earth) with your unaided eye! Venus, Jupiter, Mars and Saturn are all there in the pre-dawn skies, just waiting to be discovered. Over the next month, they all move in their orbit around the Sun, changing their apparent positions and getting closer together or farther apart in a complicated pattern. For details on all the things you can see this month in Manitoba Skies, visit the Planetarium’s “Current Night Sky” page and start your own cosmic explorations!